Nightly rate for 7 nights or more. Nightly rate for 3 or 4 nights stay. 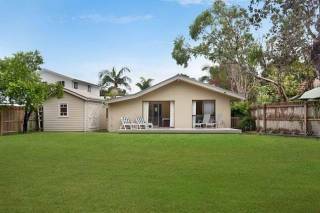 Split level architect designed beach house consisting of 4 bedrooms / 2 bathrooms across the road from Tallow Beach. Stylishly furnished and located in private bush setting with a north facing covered deck which captures the sun and a nice breeze. Just 6 kilometres from Byron Bay and walking distance to the Blues Festival. 1 bedroom with a Queen bed and the others have 2 King Singles (which can be used separately or put together as a King sized bed). Perfect for larger groups consisting of families or couples. Pets welcome. The living areas feature open plan living with timber floors, Microwave, Dishwasher, TV, DVD, CD player, Washing Machine Dryer, Gas BBQ, landscaped gardens and double carport. Maybe a walk to Cozy corner, under the lighthouse or to Broken Head to fish off the rocks?